In order to create a Twitter marketing strategy that is relevant to your business (and rocks! ), you first need to get familiar with the basic tweeting “etiquette”. 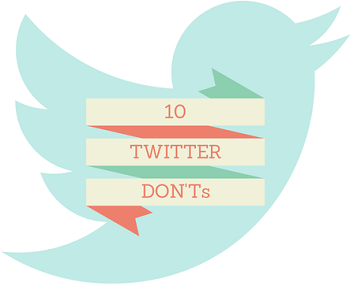 In Part 1 of this blog post you got my 10 DOs for tweeting from a corporate Twitter account. 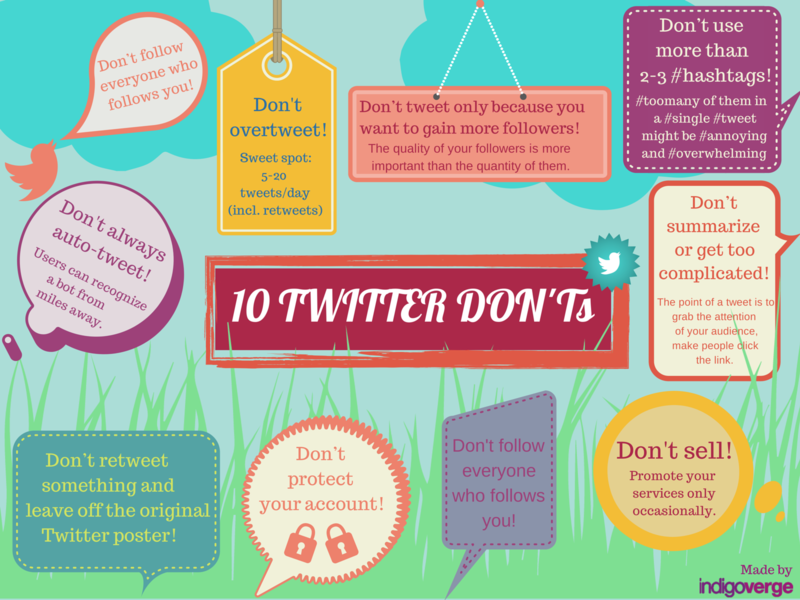 Now here are 10 things to avoid if you want to keep your Twitter followers happy. #Hashtags can be a #useful #tool, but #toomany of them in a #single #tweet might be #annoying and #overwhelming. You might hear many different opinions on how often a brand should tweet, but the sweet spot for tweets per day is actually between 5 and 20 (including the retweets). Crossing this threshold might lead to people unfollowing you. Twitter is not the place to irradiate with high-pressure sales messages. Promote your services occasionally but this should not be your main purpose. It’s OK to schedule some of your tweets, but don’t automate your entire feed. Users can recognize a bot from miles away, and the point of Twitter is to be personally engaging more than annoyingly promotional. It was once considered polite to follow just about everyone who took the time to follow your own tweets. The truth is – you should follow back only those who tweet interesting information relevant to your business. Period! Twitter allows users to protect their tweets, making their accounts visible to only approved followers. However, protecting your tweets creates a barrier between you and potential followers. Also, others are not able to retweet you and your tweets won’t appear in Google searches. There’s nothing more damaging to a Twitter presence than monotony. Sharing links to posts is worthwhile, but frequently changing the types of content you tweet will keep your followers much more engaged. With visual content playing a huge role in social media today, it’s imperative that you integrate videos, pictures and other rich content into your tweets. 8) Don’t retweet something and leave off the original Twitter poster. Lots of marketers on Twitter are trying to summarize an entire blog post or marketing campaign in just a tweet and end up with something that’s way too complicated. Don’t do this! The point is to grab the attention of your audience, make people click the link and read more. Consider the quality, not the quantity of your followers! We all want our brand to be very popular in social media, but ultimately the quality of your followers is more important than the quantity of them. Followers who truly read and consider/retweet your tweets are the real deal. Now that you are familiar with the business tweeting etiquette, you should be able to provide a much better Twitter experience to both your brand and its followers.